Those paying attention to the Monday Meeting blogs may have noticed that Deviant: The Renegades, the design of which has been my constant companion through a year or more of suckitude, unemployment, sudden relocation, house flooding, illness, and gods laughing at me, is now in First Drafts. This means that while the Deviant team are off their starting blocks, I’m back to Mage and the off-hold-again Signs of Sorcery. As I’m not at GenCon this year, I thought I’d mark the occasion by releasing another section of the book-once-more-in-progress. A glance at the Forums seems to indicate that “Grimoires: What’s their Deal?” is a popular topic, so – behold! From the pen of Changeling: The Lost Developer Meghan Fitzgerald, here’s the advanced Grimoire rules from SoS. As ever, this hasn’t been passed to Onyx Path’s hardworking editorial team yet, so grammar and such has not been prettified. Enjoy. And as for Deviant, if that’s your interest, expect a blog soon. 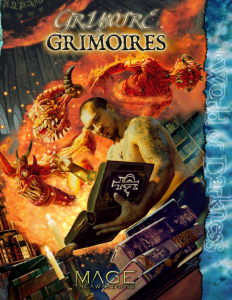 I’ve been rereading Grimoire of Grimoires recently (for in-character references on Leliel’s “Sir Night Compiles Night Horrors: Conquering Heroes” thread over at RPGNet), and it struck me that a lot of these techniques seem tailor-made to produce specific grimoires from that supplement. Was this intentional on Meghan’s part, do you know? Looking forward to it whenever it’s ready, but please don’t push yourself. Whoa, you read my series!? I don’t just read it — I’m AberrantEyes (player of Coppelia and P.G.). You’re welcome, and thank you for giving me such a cool chronicle to play in. Thanks for the sneak peek into Grimoires! 🙂 Looking forward to Signs of Sorcery and for the fist Deviant blog! Damn, 2016 really was a damn bad year from the sound of it. I hope things are turning around/will turn around soon. Cheers to your being back on Mage, since I really appreciate what you do with and where you are taking the gameline. Yay, this is the book I’ve been looking forward to the most! hope things are turning around for the better cant wait to see Signs come out, will be looking forward to Deviant to. I sincerely hope that things get much better for you. A year like that is dreadful. And, Dave, I’m hoping that things are getting better for you. 🙂 2016 (and also 2017) have been though for many of us, unfortunately.